With the assistance of many supporters, we launched our official website, http://nationalnurse.org. The home page features links to endorsements, how to take action, information about our organization, frequently asked questions, a contact page, and also a link to this news blog. The NNNO co-sponsored two health promotion events; the Haunted Hospital and a Healthy Living Fair. Thanks to supporters in Massachusetts and Vermont we saw resolutions urging the US Congress to enact legislation to create an Office of the National Nurse pass unanimously out of their state legislative branches. We added new graphic designs to the National Nurse merchandise found at Cafe Press , with the help of Paula from Michigan. We were able to send out one to two newsletters each month and you are encouraged to send your email to Teri to receive these updates. Several of you sent us cash donations and we appreciate this support to help maintain our website, mailing list, and travels to educate others about the Office of the National Nurse Initiative. In March 2008 we traveled to Washington DC and met with several members of Congress, their staff, and also with those who serve in the USPHS. 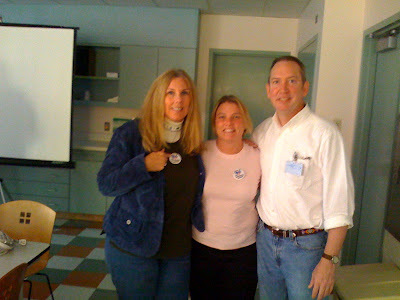 For anyone who wishes to take a trip down memory lane, click on the archived months of 2008 at www.nationalnurse.blogspot.com to follow our journey. Kansas Parish Nurse Ministry Inc.
Our board members traveled to Las Vegas (Nevada), Portland (Oregon), Baltimore (Maryland), and Tampa (Florida) to present the Office of the National Nurse Initiative. We wish you the happiest and healthiest of holidays and look forward to 2009! On November 21st NNNO Board members Teri Mills and Alisa Schneider had the pleasure of presenting the Office of the National Nurse: Leadership for Prevention at the Oregon statewide conference of the American Association of Women in Community College. The theme of this year's conference was Perseverance, Power, and Purpose: A New Conversation About Leadership. Thank you to Program Chair Cherie Maas-Anderson for extending an invitation so this presentation could be heard. The mission of our community colleges is to improve the lives of those who reside in our communities and the ONN initiative dovetails into this philosophy. Service learning is an integral component of the community college's educational experience and many attending the session have connected their students with these opportunities. The National Nurse vision presents dramatic potential for involvement of all health career students in their local communities. Health and Wellness Fairs, Immunization Clinics, Earthquake and Disaster Preparedness programs are but a few examples of opportunities. Students can earn service learning credits and also demonstrate leadership in organizing community events. Knowledge of public health is essential, especially for today's nurses. Nursing education has a goal of producing graduates that are at least familiar with beginning public health nursing competencies. We are recommending that schools of nursing partner with the Medical Reserve Corps, parish nurses, and other community agencies to enhance the public health infrastructure in their communities. When students get involved in community outreach and education through partnering, the experiences are transformative for many, including the mentors. Students also gain valuable exposure to public health professions and programs. Our board members appreciate invitations to speak to organizations and stakeholders interested in learning more about the Office of the National Nurse initiative. Please email Teri . if you are interested in inquiring about their availability for a future speaking engagement. "Here we are in class at the University of San Francisco in our MSN program to obtain a new Clinical Nurse Leader credential. I love being back in nursing school after all these years to give back. The Office of the National Nurse is just what we need. For too long we as a profession have not given ourselves enough recognition and it is now time to stand for wellness and health promotion, not just treatment! Thank you for your persistence in making this happen." "I am a Medical Surgical Registered Nurse and see the devastation of disease and illness everyday at Alameda County Medical Center. I am also currently back in school at the University of San Francisco getting my master’s and will be a Clinical Nurse Leader when I graduate in 2010. Change is needed! The Office of the National Nurse is what the United States and the profession of nursing needs. Currently the U.S. spends 1.3 trillion dollars on disease and illness, why not on prevention? Please give nurses the recognition for our hard work. The Office of the National Nurse would create change in how we look and treat individuals in a healthcare system. Nurses are the ones who spend countless of hours with patients in caring and treating them. Who better to help make a positive difference in healthcare, than a National Nurse? The National Nursing Network Organization has learned firsthand with the Office of the National Nurse initiative that such "groupthink" phenomenon, the adoption of words, phrases and viewpoints that are initially expressed by someone else, and then become the norm or the supported position, is a factor in professional nursing organizations. Organizations will "sign-on" to adopt or reject a position because it is perceived to be supported by all those in a respected leadership status. Often times, additional leaders as well as rank and file members are provided no opportunity to dissent and thus have little inclination to seek an objective analysis. Without encouraging discussion, surveying members, or assuring solicitation and analysis of opposing viewpoints, 'groupthink' can polarize around an initial popular viewpoint, even when this viewpoint is, in reality, simply the initial assessment of a few individuals. Then, because it is described as the Position of a respected professional organization, the groupspeak platform is adopted and defended by similar organizations, without any opposition, dialog, investigation, analysis or critical thinking. It is reminiscent of the popular cliche' "I have made up my mind, don't confuse me with the facts." So why does "groupspeak" occur? Is it due to a basic human tendency to "sign on" to assure personal inclusion in the group and avoid being shunned. Or in today's busy pace, is it simply expedient, and groupspeak is embraced rather than expending the time and energy to pursue a thorough analysis of all perspectives and incorporate an objective decision making process. Adopting groupspeak also minimizes confrontation, and many people have an aversion to discussions that are argumentative or represent opposing views and take passionate dialog as a personal assault. Yet this is exactly what is needed--healthy sharing of differing viewpoints, time to dialog and hear others' perceptions, and opportunity to share and reach agreement. It is reassuring to consider the Obama administration will have the advantage of diverse viewpoints and will be an environment that weighs issues objectively to reach a true consensus. Minimizing "groupspeak" is one way leadership of nursing organizations could improve their performance, gain credibility with rank and file members, and could positively impact decisions that will have far reaching implications for healthcare reform. What is not discussed is that the dissenting opinions on the methods of a National Nurse office may not be given a hearing. Obesity, diabetes, hypertension as examples of problems which would be approached by recommendations of diet and exercise are short-sighted and are part of a still conservative approach. What about deficient Vit D levels associated with obesity? Preliminary research shows a link. What about lower levels of postassium in hypertension? Research available. What about corn syrup solids as implicated in diabetes, and hypertension? Research done. Will the National Nurse office be innovative or simply follow the status quo? The same difficulty of developing a questioning mind set in nurses after so much training to follow orders will be a critical challenge. Following orders is vital, but so is a questioning 'thinking ouside the box" ability. Can nurses do both? And when research is not conclusive, will nurses call for more follow-up research if it is outside the pharmaceutical industry? If not the public will view the office and nurses as an extension of an industry with a vested interest in it's own profit. How politicized will the Office be? Credibility is on the line. These are excellent questions and show the value of allowing/encouraging discussion of all viewpoints. Certainly, one intent of having the ONN lead prevention efforts would be to assure that recommended interventions be evidence based. Also, the National Nurse would support funding and incentives for continued research to develop the science and validate innovative approaches to healthcare. The National Nurse's advocacy role would serve to keep policy and funding decisions front and center for supportive legislation and action. Envision a system that would allow for rapid processing of input, data and consideration of suggestions from nurses for progressive approaches to their local health challenges. Exploring processes and outcomes could be expedited and, when appropriate, approaches with promising potential could be rapidly inititated. The ONN will not be funded with pharmaceutical dollars-this will also be an advantage. Finally, you asked if the office will be politicized. We are recommending the CNO of the USPHS become a full time position with the official and legitimate title, National Nurse to provide visible, recognizable leadership for prevention efforts. Unlike the Surgeon General, this position is NOT a cabinet or presidential appointment, but rather a position reached after long meritorious service in the USPHS, with ascension to the position subject to peer approval. However, the NN would be a governmental position, and like the OSG it would be subject to aspects of the agenda of the current administration. Please let us know if you have further comments for discussion. Thanks again for your posting. 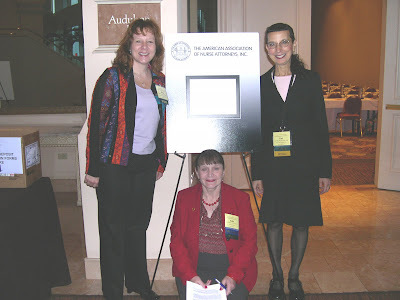 Thank you to Rosemary McCarthy, President of The American Association of Nurse Attorneys and the Board of Directors for inviting Teri Mills MS, RN, ANP, CNE and Alisa Schneider MSN, RN to keynote their 27th Annual Meeting and Conference held in Tampa, Florida on October 23-25, 2008. Presenting to this esteemed group of professionals was an honor, as TAANA announced their support of the initiative earlier this year. Teri and Alisa’s presentation, “The Office of the National Nurse: Policy for a New Era of Prevention” introduced the initiative to nurse attorneys, nurse law school students, and legal nurse consultants. The group participated in discussion of the current evidence for the need for a nurse-led focus on prevention, the political process the National Nursing Network Organization has used to move the initiative, and the current obstacles the NNNO is facing in their work. 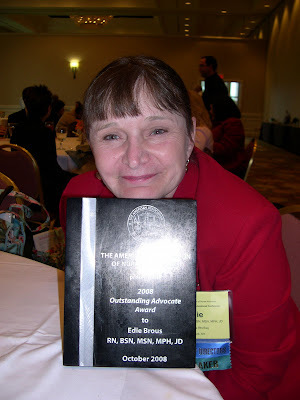 Congratulations to Edie Brous RN, BSN, MSN, MPH, JD who was awarded the Outstanding Advocate Award, recognizing her outstanding legal advocacy. Edie was instrumental in passage of the New York State Assembly’s resolution urging Congress to enact legislation to create an Office of the National Nurse. TAANA members enthusiastically offered their support at the state and local level and we look forward to continuing to work with the nurse attorneys on advancing the ONN proposal. Medical Assisting Degree in New York (NY), College for Criminal Justice Career, Pharmacy Technician Degree NY, Business & Accounting Careers,Network Administration College Degree.So you can also visit .